Somehow this was a strange and rather wild, up and down week. Good stuff happened, not so good stuff happened. One exciting opportunity crumbled, a new one appeared. I got a flat tire and had to get a new tire thanks to the metal spike plunged into it. At least a friend had a can of Fix a Flat to get me to the local tire repair place. Wayne, Jeff and Matt all got sick one after another (hope I am not next), while I missed friends and family who have passed away and reveled in cherished memories with other friends. Grab Bags got pulled and shipped early, while deadlines on books continue to stretch. We lost heat in the warehouse, but our imaginations and creative energies have never burned hotter. We are working like maniacs all the darn time, but there never seems to be enough hours in the day to get it all done. Whew. Details follow. Some kind of head cold or bug has been plaguing the office staff. First Wayne caught it, then Jeff, and most recently, Matt. It involves fever, sore throat, and sinus issues. Hoping I manage to escape it. My own energy levels have been up and down. Not because I've been sick, but because I've been thinking about the passing of my dear friend Kathyrn Kozora. This, of course, brought about memories and emotions about Erick Wujcik, who died in 2008 (Kate and Erick were sweethearts for as long as I've known them), as well as my father, who passed away in October of 2010. It also reminded me of all the loved ones I've lost to cancer. Besides the above, there has been my beautiful mother, grandmother, Keith Parkinson and too many others. Some of those memories were bittersweet and made me melancholy, and interfered with my focus and writing. Some of that made me feel warm and fuzzy and inspired me to write. I met with friends Paul Deckert and Sarah Yurich (Kay’s granddaughter in town for the week) and we spent the evening together laughing, crying and romping down memory lane. We’ll miss you Kay, Erick, Dad, Mom and all the rest, but you made our lives fuller and richer for having been in them, even if it was all too short. We LOVE doing the Christmas Surprise Package offer for you guys and gals. It’s our way of showing our appreciation. You are crazy not to take advantage of it and buy at least one. It is so worthwhile. But man oh man, are they a ton of work. We did a bunch of prep-work for it. We made dozens and dozens of boxes for shipping, rearranged table space, and the staff signed 600 or 700 books. - Chuck Walton came by on Tuesday to drop off his gorgeous Rifter® #64 cover and signed a few hundred books for Surprise Packages. - Mark Dudley came by on Wednesday to sign a couple hundred books and promised to return soon to sign more. Though we said we probably wouldn't ship the first Surprise Packages out until Monday, November 11, I was so excited to send them off that I had the first 50 Surprise Packages packed up and shipped out by Thursday. They are on their way to many of you right now! Enjoy. The rest of you, get your orders in! Erick Wujcik was a game designing genius and one of my closest friends. You know his work from such titles as Teenage Mutant Ninja Turtles®, Ninjas and Superspies™, Mystic China™, After the Bomb®, Rifts® China One and Two, his contributions to Palladium Fantasy®, Rifts®, Dragons and Gods™ and the original Beyond the Supernatural, as well as his own Amber Diceless RPG, Ambercon and other achievements. With the passing of his beloved Kate, we’ve all been thinking and talking about her and Erick. I know many of you knew and loved Erick personally, and many more via his body of RPG works. Wujcik keepsake upon request. I have been able to make special arrangements to give those of you who request it, a memento/keepsake of Erick Wujcik in the 2013 Christmas Surprise Package. I have something like 100 paperback books and 100 issues of various magazines from the 1990s like Locus, Analog and Asimov, that belonged to Erick, were read by Erick and were part of his personal collection. Some of the magazines even have the address sticker with Erick’s name and address. Erick was a voracious reader and loved books, especially science fiction. You can request an Erick Wujcik keepsake in your Wish List or Comments section. Everyone who asks will get one. I have about 200 items. Available while supplies last. When I run out, I will try to see if I can get more. I can’t promise whether the Erick Wujcik keepsake you get will be a paperback novel or a magazine. 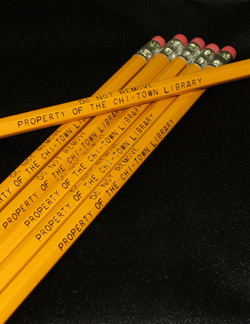 EACH will either be stamped as the “Property of Erick Wujcik” or come with a super-simple statement of origin. NOTE: This is a sentimental memento. The items sent have little to no value other than being a fun read and having been owned and read by legendary game designer Erick Wujcik. Just a little something from Erick, Kay and the Palladium family during a season of joy and kinship. Only people who request a Wujcik keepsake will get one. UPDATE: Rifts® Northern Gun™ One – Available now! Rifts® Northern Gun™ One is selling like crazy and people are loving it. No word from the printer on when the NG-1 Hardcover editions will arrive, but it should be soon. 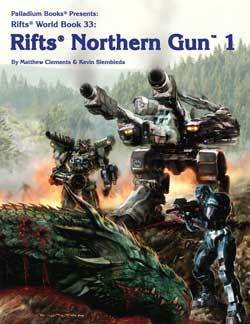 Wayne has posted a FREE Sneak Preview of Rifts® Northern Gun™ One available on DriveThruRPG.com right now for your enjoyment. There are also previews available for the Rifts® Vampires Sourcebook, Rifts® Vampire Kingdoms™ (Revised Edition), Rifts® Black Market, Rifts® Lemuria, Dead Reign™ RPG, Endless Dead™ sourcebook and others. The original Rifts® Vampire Kingdoms World Book is also available as a PDF on DriveThruRPG, for those of you who may be interested. More than 90 other Palladium titles can be found on DriveThruRPG.com as PDFs, including Splicers®, Rifts® RPG (the edition before RUE), The Rifter® #1-52, and first edition rule books and sourcebooks for Palladium Fantasy RPG®, Heroes Unlimited™, The Mechanoid Invasion® Trilogy, Beyond the Supernatural™ and lots of other good titles. 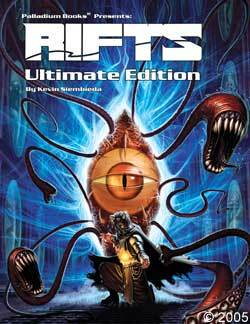 DriveThruRPG.com also offers the Rifts® and Palladium Fantasy® Game Master Kits ($5 each; both written by Carl Gleba and complete with maps, combat matrix, character sheets, spell list, and 20 pre-rolled characters created by Julius Rosenstein). Check it all out. This is another fine issue of The Rifter®, but it has not yet gone to the printer due to illness. Sorry, should be sent to the printer next week. It has material for Rifts®, Dead Reign™, Nightbane®, Palladium Fantasy® and other good stuff. Including official stats and background for the characters on the cover: A new type of dragon known as the Winter Serpent, plus the more savage cousins of the Bearmen of the North, the Ice Bearmen. Both conceived by Chuck Walton, developed by me (Kevin Siembieda) and written by Matthew Clements. See the cover and the whole description elsewhere in this Update. Same story. With half the office sick, progress on books this week has been sloooow. As I've said before, this book is fun and exciting. Matthew Clements has outdone himself on this sourcebook. 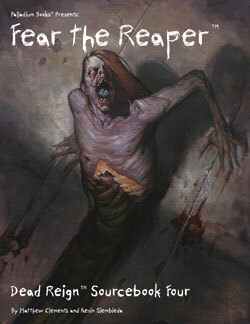 Fear the Reaper™ will present in-depth background, info and character material on the zombie hunters known as the Road Reapers. See the complete description for it elsewhere in this Update. Nothing got done on NG-2 this week, but that will change very soon. Chuck is working away on art. See the full description for it later in this Update. How about that cover (see below)? Nice, eh? More to come. This will be a hot, early 2014 release. It has been an exhausting week. I’ll be working over the weekend. If Wayne is up to it, he’ll be working part of it, too. Our top priority is books. Enjoy the Christmas Surprise Package and keep those imaginations burning bright. Christmas Surprise Packages – Available NOW! Christmas Surprise Packages or Grab Bags are a long running holiday tradition in which you can get several RPG titles at a substantial discount. It is our way to say thank you to our many fans for being so kind and patient, and for your years of support. You are appreciated more than you may know. Christmas Surprise Packages are not just for Christmas. Whether you celebrate Christmas, Hanukkah, Kwanzaa, or the Winter Solstice, or you’re looking for a gift for a birthday, anniversary, Valentine’s Day, or other special occasion that falls between now and February, a Surprise Package may be the ideal way to go. You get a ton of stuff on the cheap, you can get a bunch of autographs, and you look like you spent a fortune. The Palladium Surprise Packages are designed to simulate the fun, joy and surprise of the Christmas Season of Giving. In this case, Santa Kevin (yeah, that’s me) has you submit a list of 10-12 Palladium products (or more) that you would like to receive in your Christmas Surprise Package. This list of 8-12 (or more) items is critical, because you will not know which items you’ll be getting. That makes it just like a Christmas gift because it’s a surprise! 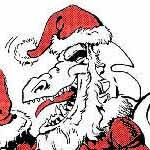 Plus, Santa Kevin, who personally handpicks every item for every Grab Bag, may toss in something extra like a limited edition print or T-shirt, or issue of The Rifter®, or something else he thinks you’ll enjoy. It only costs $40 plus shipping to get $80-$90 worth of Palladium product! First-timers are always nervous until they see the great value in their first Surprise Package. A typical Grab Bag has $85-$90 worth of product, sometimes more. Many people order 2-3. Some order 4-6, and some maniacs order even more! It makes sense, because it is a great way to fill holes in your own collection, treat yourself, get autographs, try new games and settings, and get your gaming pals gifts. A.C. in Mesa, Arizona, writes: Thank you for providing this fine service. My nephew (and many others, of course) looks forward to it every year! J.W. in Fort Belvoir, Virginia, writes: Thank you for producing such enjoyable titles for us all year long, and offering this Surprise Package every year. I faithfully remain your customer for life. T.R. in Mustang, Oregon, writes: Thanks guys. This is a great way to finish off my Rifts® collection. M.M. in Round Rock, Texas, writes: I look forward to the next Robotech® Kickstarter! Thank ya’ll for good books. D.A. in Spokane, Washington, writes: I’m such a huge fan of Rifts®. I love to get lost reading the books and enjoying an occasional Friday night campaign. Keep up the great work. S.S. in Clearfield, Utah, writes (in part): I am so looking forward to Beyond the Supernatural books next year. D.L. in San Francisco, California, writes: Thanks for all the amazing work you put into your products. C.L. in White Sulphur Springs, Montana, writes: Hope you all have a very happy Thanksgiving and a Merry Christmas! Keep up the fantastic work! Much more next Weekly Update. 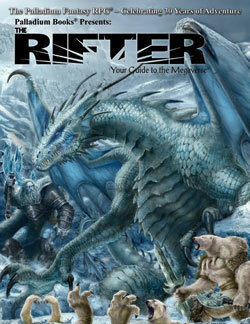 Rifts® World Book 33: Northern Gun™ One – Available Now! 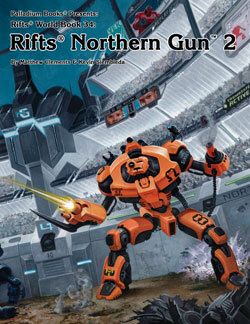 Rifts® Northern Gun™ One is the most tech-filled World Book Palladium has ever produced. In addition to world information, background and O.C.C.s for the Northern Gun corporation and Ishpeming, there are 27 robots, 70+ weapons and all kinds of dynamic information and gaming resources. Courtesy of the largest arms dealer and independent manufacturer on the continent: Northern Gun™. Softcover edition is available NOW! The Rifter® #64 presents optional source material for Rifts®, Dead Reign™ (zombies), Nightbane®, Palladium Fantasy RPG® and more. Each and every issue of The Rifter® is an idea factory that provides useful, ready to use, source material gamers can just drop into their ongoing games. 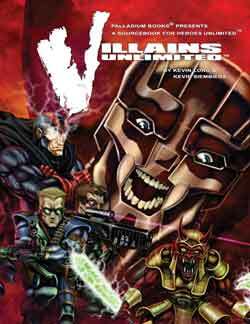 Rifts® – The Black-Malice Legacy, Part II – by Matt Olfson and Will Hunter. Source material about the Coalition States’ psionic operatives and technology, including squad formation and new psychic martial art classes for special operatives in CS Psi-Battalion. Rifts® Short Story – A Cold Night, Dead Past by Brett Caron. Dead Reign™ source material by Jeff Duncan. New Survivor Occupations and related skills set in the Zombie Apocalypse. Nightbane® source material by Bryant Telfer. A new class of mystical wanderer and Nightbane. Palladium Fantasy® Adventure by Michael Osborne. Play Giant characters or pint-sized humans who invade the lairs of Trolls and evil beings in control of dark magic. Palladium Fantasy® Winter Serpent and Ice Bearmen by Matthew Clements, Chuck Walton and Kevin Siembieda. “Official” Fantasy source material. 96 pages – $11.95 retail – Cat. No. 164. November release. Reminder, The Rifter® #63 included a Robotech® RPG Tactics™ eight page photo spread showing dozens and dozens of the mecha figures coming in that series. 48 pages – $12.95 retail – Cat. No. 234. November release. 192-224 pages – $24.95 retail – Cat. No. 888. December, 2013 remains our target date and seems doable at this stage (tentative). 192 pages – $24.95 retail – Cat. No. 876. January/February release. 160 pages – Cat. No. 553 – $20.95 – Shooting for a quick release, but early 2014 seems realistic. The only product people are more excited about than the two Rifts® Northern Gun releases is Robotech® RPG Tactics™. Momentum is building to a fever pitch. Fans will not be disappointed. Demos at the Alliance Trade Show got nothing but big, toothy smiles and positive reviews. Here’s are some details. ● Flexible Date of Release: An exact release date is yet to be determined, but it is looking like some time in February, 2014. Ninja Division’s original projections had product delivery at October or November, but we were all a bit too optimistic. In order to make this game line everything it can be, there have been delays. As a result, the game has yet to be sent into manufacturing. That said, 98% of the work is completed, the game pieces look incredible, and Ninja Division is wrapping up on final packaging, layout and tweaks. We expect to get final approval from licensor Harmony Gold in two or three weeks. At which point, Robotech® RPG Tactics™ goes into manufacturing. Factoring in manufacturing time, shipping from China and other factors, it is looking more and like a February 2014 release. We’ll see. Note: As stated in the past, we will ship product to the Kickstarter supporters before we ship to distributors. ● Expansions released in waves. Palladium plans to release Robotech® RPG Tactics™ products in waves. The core box game and first six expansion packs will be the initial release. 4-6 additional expansion packs of mecha game pieces will ship approximately every three months thereafter. ● Robotech® RPG products – available now. Don’t forget that Robotech® RPG products are available now. 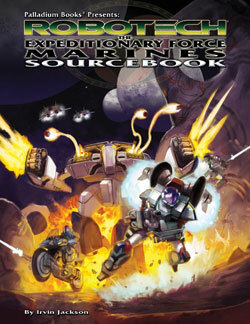 They include the Robotech® Shadow Chronicles® core rule book available as a $30.95 hardcover (Cat. No. 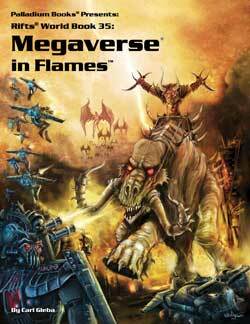 550HC) and as a $16.95 manga-sized RPG paperback (Cat. No. 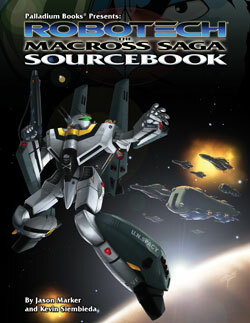 550), and the Macross® Saga Sourcebook (Cat. No. 551) which is the same setting as the Robotech® RPG Tactics™ game. Each book is a wealth of background information about Robotech® and fun to read and play. With excitement growing for Robotech® RPG Tactics™, there is renewed interest in the Robotech® role-playing game line. ● New Robotech® RPG products coming in 2014. Palladium has three new Robotech® sourcebooks in development. UEEF Marines Sourcebook One, UEEF Marines Sourcebook Two and The Zentraedi Protectorate Sourcebook are all slated for release before Summer 2014. Additional Robotech® sourcebooks are on the drawing board. ● Palladium is working with Harmony Gold to expand the scope of its license to provide you with an even greater range of Robotech® products. Release Date: Barring any further delays, the Robotech® RPG Tactics™ box game and initial expansion sets ship February 2014 (tentative). The initial expansion packs will also ship at the same time as the main box game. All prices listed are likely, but still tentative. We want most packs to fall in the $25-$35 price range. Additional expansion packs to be released in waves every few months, 4-8 at a time, throughout 2014. More will follow.